“Manal and Alaa: A Love Story” Copyright © 2015 by Lena Merhej. 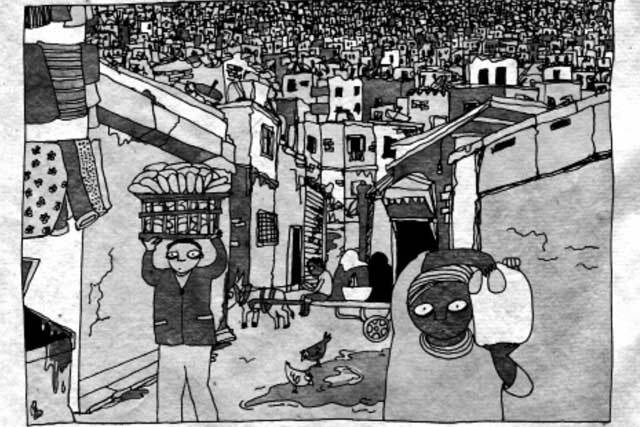 Published in Muqtatafat, a comics anthology featuring artists from the Middle East region (Ninth Art Press). Reprinted with permission from the author. Lena Merhej, PhD, is a visual storyteller and an expert in graphic narration. She taught at several universities in Beirut. She is the founder and director of the Story Center, which offers professional trainings in animation, illustration and comic books. She is also the director of the Lebanese festival, Beirut Animated. She now works with Tosh Fesh to promote comics and animation in Arab countries. Lena Merhej illustrated over 25 Arabic children’s books and has exhibited her work internationally. Her animation Drawing the War (2002), her comic book, Kamen Sine (Another Year)(2009), and her book Mrabba w Labban (Yogurt and Jam) (2011) took international awards. She is a co-founder and a member in Samandal, a award winning comics organization in Lebanon. Recent comics she worked on are “Làoù il y a la vie, il y a l’amour” for Solidarités International and “Manarat” for OXFAM.